Students studying in Kelvin Smith Library (KSL) on Friday, Sept. 14 may have noticed the four foot tall walls of faces around the library. The faces belong to black and white portraits by artist Mark Krieger. The pieces are part of “For the Children,” a Latino art show hosted by the Latino student group La Alianza and the faculty group Alianza Latina/Latino Alliance. The show is a formal kick-off to National Hispanic Heritage Month which runs from Sept. 15 to Oct. 15. “For the Children” is dedicated to the nearly 13,000 immigrant children being held in detention centers across the United States. “The purpose of the art show is to kind of anchor [Hispanic Heritage Month]. We like to open every year with a celebration. With the art show and music,” said Kari Colon-Zimmermann, a research assistant in the Neurological & Behavioral Outcomes Center at University Hospital and a member of Alianza Latina. This year’s exposition comes at an especially turbulent time for some Hispanic-Americans. On Wednesday, Sept. 12, two days before the art exhibit opened, the New York Times reported that there were now roughly 12,800 immigrant children detained in federal shelters. This marks a nearly five-fold increase from the 2,400 children detained in May 2017. The show brought people of all backgrounds together to celebrate Hispanic heritage and a common human dignity. 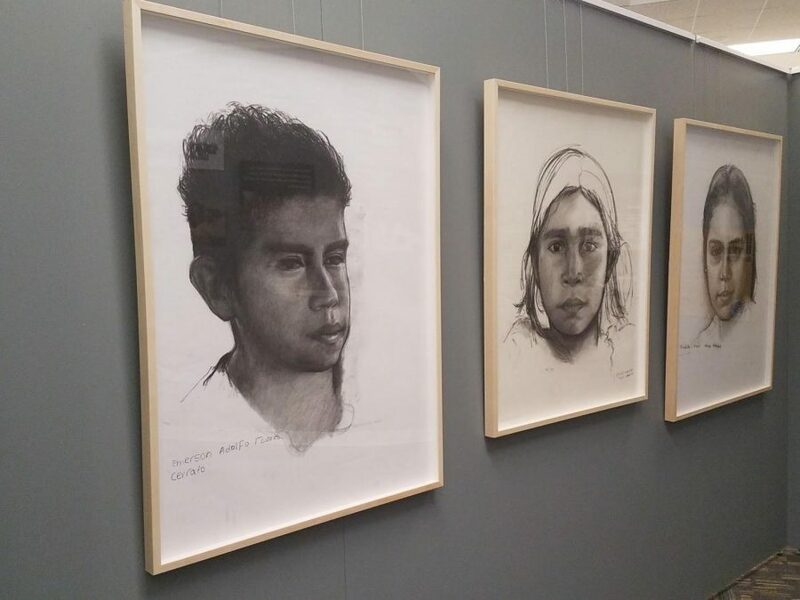 Krieger’s portraits will be on display until the end of Hispanic Heritage Month. The pieces depict the faces of young children Krieger encountered during his travels in South America. The drawings, done with conte crayons on huge pieces of paper, bear faces that feel familiar. From their places on three portable walls erected near Cramelot Cafe, eyes full of humanity stare out across the library. Looking at the stunningly realistic faces, it is impossible not to find empathy for the pictures’ subjects. The colorless drawings overflow with unmistakable childhood features: lopsided smiles, messy hair and eyes that hold a deep, unguarded compassion for the world around them. The subjects scrawled their names across their portraits in big, lopsided letters. Next to Krieger’s precise, lifelike strokes, the childish handwriting humanizes the picture-perfect art. The children’s photorealistic expressions, combined with their messy signatures, remind the viewer of childhood laughter and memories. Richter said it is important to celebrate the commonality between all people. “By learning about people from places very different than where we are from, we learn what is common among us. That common background is humanity,” said Richter. Suzanne Rivera, Ph.D., vice president for research at the Office of Research and Technology Management and executive sponsor of Alianza Latina, shared a similar sentiment. “This event is important because it shows the values of CWRU, values like inclusion and diversity. Celebrating Hispanic heritage through the month is a good way to highlight the unique contribution Hispanic people make to American society,” Rivera said. Grupo Kawakan, a local salsa band, provided the music. The band set up on KSL Oval and catchy, jubilant beats filled the air soon after. Faculty and students alike danced in the warm summer afternoon to sharp drum beats and swinging saxophone melodies. Frank Lopez, a member of the band and Cleveland resident, explained that during this celebration, music brought people of all backgrounds together. La Alianza and Alianza Latina will be hosting a variety of other events over the course of Hispanic Heritage Month. The events will celebrate Hispanic art and societal contributions as well as address social issues facing Hispanic communities. These events include a panel discussion on Sept. 25 about the effects of the physical and psychological trauma facing children currently held in federal shelters.